Looks like I pushed my luck too far when I tried giving this setup another go. Boy, am I glad I scaled down my risk! After almost 10 weeks of keeping EUR/GBP contained, the .8400 handle finally broke down. Okay, maybe “broke down” is a bit of an understatement. It downright EXPLODED! It was like the market finally released all its pent up energy for this one big move! To be honest, I was sort of caught off guard by it all. I wasn’t expecting any big moves since the euro zone only had PMI reports on tap and I didn’t expect that to be a big market-mover. Little did I know that it was the Bank of England’s MPC meeting minutes that would do me in. Again, I found this a bit surprising because MPC meeting minutes usually don’t offer any new information to the markets. But this time was different. It showed that two BOE members actually voted for a larger increase in the BOE’s asset purchase program (75 billion GBP instead of just 50 billion GBP), which basically says that there are at least 2 policymakers who believe the U.K. could use more easing. This caused the pound to sell off sharply across several markets, leading my trade to get stopped out just hours after I had gotten triggered. No reason to sulk over this trade because it was a valid setup and it didn’t deal my account a big blow. As Cillian Murphy says, “Bag the loss and move on!” Thanks for following, guys! That range on EUR/GBP worked out so well last week, I think it’s worth trying out one more time! Once again, EUR/GBP is testing the .8400 handle, which has served as solid resistance for nearly TEN weeks now! Do I think it’s worth playing again? Heck yea! Truthfully, I was actually a little hesitant to trade the past couple of days, as the Greek debt deal was set to be passed. Oddly enough, even though the deal finally pushed through, we didn’t really see a sustained rally in euro pairs. I guess many traders and fund managers felt that European leaders simply had no choice but to pass the deal and had already priced this in over the past couple of weeks. That said, I think it’s safe to start dipping my green feet into the markets. For now, I’ve set my short order at .8395, just a few pips below the PWH and .8400 handle. I’ve set my stop at .8440 and my profit target will be at the bottom of the range at .8290. This time though, I’m going to scale down my risk a little bit, as there are some factors that I have to take into account. First, I am wary of the uncertainty in the markets right now and there’s no telling if we’ll see a delayed reaction to the passing of the debt deal. Second, I see a rising channel forming as well that could give my trade some trouble. I’ve decided to risk just 0.75% of my account on this trade to limit my exposure. 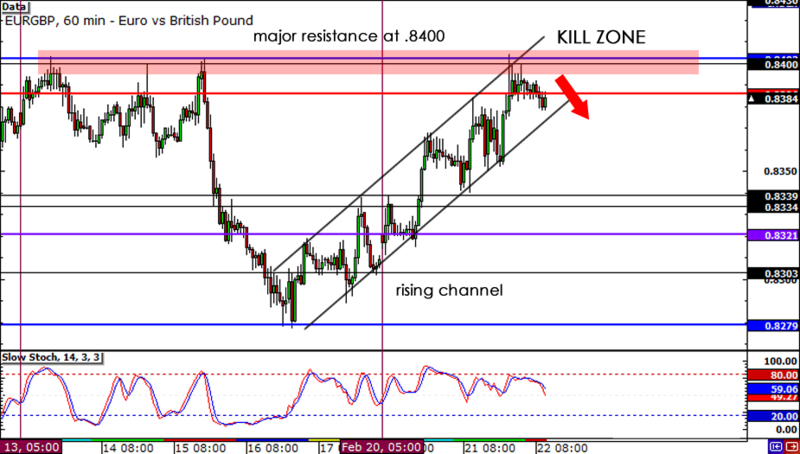 Short EUR/GBP at .8395, stop loss at .8440, take profit at .8290. Will the range continue to hold? Hit me up on Twitter and my Facebook page and let me know what you guys think! 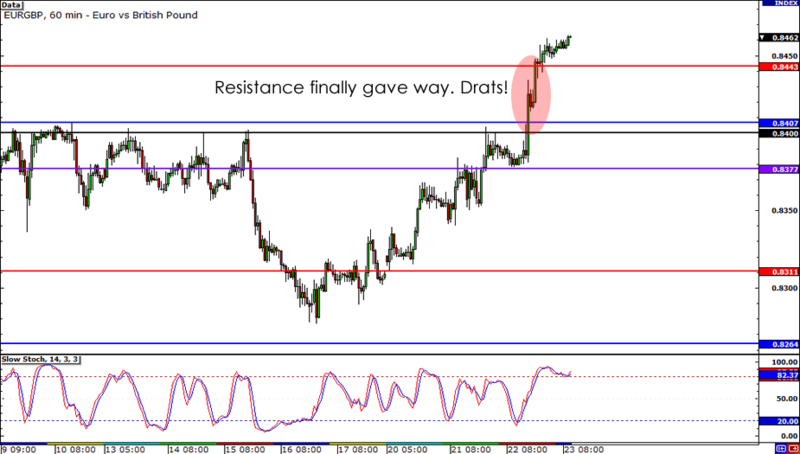 Will resistance at .8400 hold again?